Blender - Add one scoop of ALPHA G3NETICS 100% WHEY to a blender filled with 300-400ml of water and blend for 30 seconds. To create an ever tastier shake, try adding ice cubes with a serve of fruits or even a scoop of peanut butter. Think Outside The Shaker- ALPHA G3NETICS 100% WHEY can be used for more than just protein shakes.Try mixing a scoop into oatmeal, yogurt or over your morning breakfast cereal. Better yet, add a scoop or two into your cooking to increase the protein content of muffins, pancakes or slices. The elite formation of ALPHA G3NETICS 100% WHEY begins with the very first ingredient, Whey Protein Isolate (WPI). By using WPI as our first choice of ingredient, we are able to pack 27 grams of fast acting, lean muscle building protein and filter out impurities, providing you with a clean performance fuel. ALPHA G3NETICS 100% WHEY has significantly low levels of cholesterol, sodium, fat and absolutely no artificial colours or flavours. We know that every ingredient counts and that’s exactly why this amazing tasting, protein packed fuel has up to 30% more branched chain amino acids, plus added L-Glutamine, digestive enzymes and vital nutrients to maximize amino acid absorption. We demand superior quality every step of the way, and that is exactly what makes ALPHA G3NETICS 100% WHEY second to none. 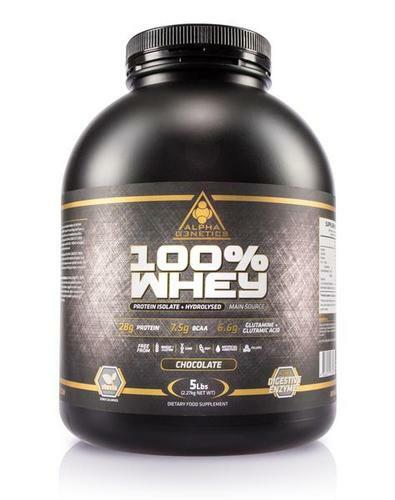 If you think ordinary protein is good, wait until you have tried ALPHA G3NETICS 100% WHEY! ALPHA G3NETICS 100% WHEY serves as proof that our top priority is delivering you with amazing tasting, advanced performance solutions.